From the end of 1952 to 1955, the C-Type was at home on many of the famous racetracks and successfully used the star pilots of the 1950s on the steering wheel. The drivers basked in the car’s success and the Jaguar brand basked in the success of the victorious pilots. No matter how big the challenge of the competition was, there was always a team in a C-Type that accepted – even in the toughest motor sport event of the fifties, the Carrera Panamericana. The drivers Ibarra and Pinal appeared in 1953 and 54, but did not finish. Nevertheless, CMC has decided to develop this historically and also interesting color scheme. XKC029 was delivered on November, 24th 1952 to the Jaguar dealer USA-West Charles Hornburg. They sold the vehicle in early 1953 to Paco Ibarra to Mexico City. The Mexican racer put the C-Type in the World Cup run of the Carrera Panamericana 1953, but had to give up early in the race after an engine failure. 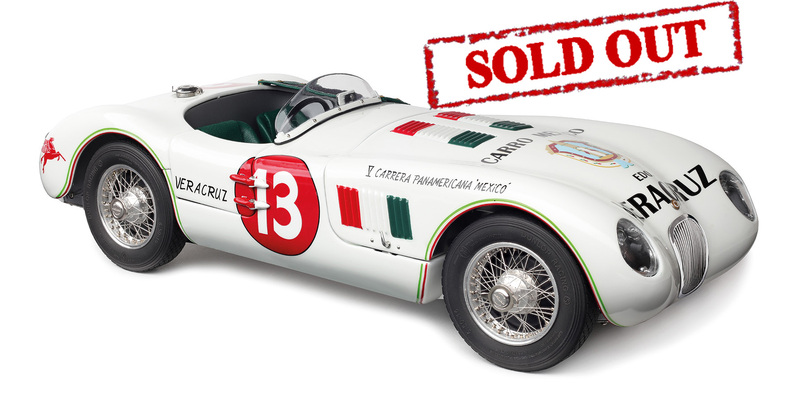 The C-Type was then sold to Javier Velazques, who participated again with the driver crew Ibarra / Pinal at the `54 Carrera Panamericana. But the second attempt the C-type also failed. Still, it is the only one of the more than fifty C-Types that ever participated in the contemporary event. Only a few years later, the car reappeared at a collector in Massachusetts / USA. In 1981, XKC 029 was sold to England and remained there for over 30 years owned by the Dunkerley family. In 2010, this C-Type was presented on the occasion of the annual Goodwood “Festival of Speed” hosted by the Earl of March in its largely authentic 1954 Panamericana livery and received an enthusiastic reception from the audience present. CMC has therefore decided to authentically adapt the model to the actual state of this Jaguar. In 2016, the vehicle was sold by British specialist Fiskens.